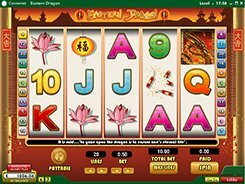 Eastern Dragon is a 5-reel 20-payline video slot with a Chinese twist to its graphics and a set of symbols that include firecrackers, pink lotuses, lanterns, koi fish and other themed icons as well as traditional playing cards. You may set the number of active paylines and a line bet ($0.01 to $2), thus the minimum and maximum bets are $0.2 and $40 with all lines activated. The top jackpot prizes in the game are $8000, $6000 and $2000. The Dragon symbol helps complete winning combinations by standing in for regular icons. Besides, the wild is also a feature triggering symbol that unlocks a free spin game when landed on both reels 1 and 5. Should this happen, you get 15 free spins, during which all payouts are multiplied by x6. There is a scatter symbol in the slot (Golden Coin) but it does not activate any bonus feature. Anyway, hitting five scatters awards the largest prize (see above) no matter where exactly the scatters landed. 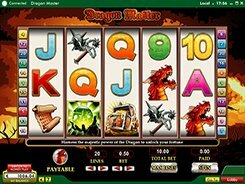 With all this in mind, Eastern Dragon cannot boast of having plentiful features, yet its smooth gameplay and frequent wins will keep you entertained all the way. PLAY FOR REAL MONEY!